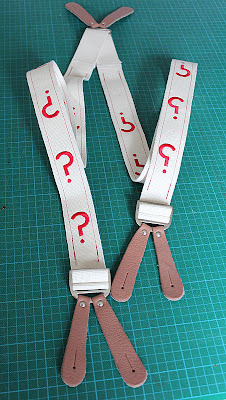 Having used Spoonflower rather extensively over the past few months, I have been looking for other opportunities where the ability to print short-run bespoke fabric could be utilized. 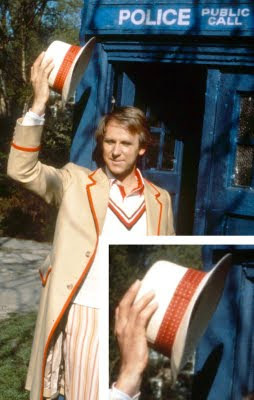 One which stands out is the hatband ribbon on Peter Davison’s hat (see left). I can remember back in 1982, when the costume was current, noticing that the ribbon used had a rather distinctive pattern. 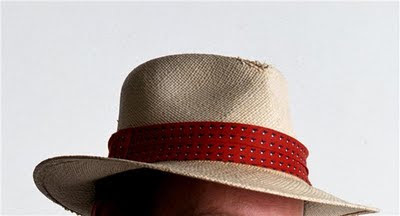 Whereas most polka dot patterned ribbons have the dots in a diagonal matrix, the Five Hatband has them in rows and columns. It could also be seen that there was a black ‘shadow’ dot behind the white ones. Back in the 1980 the proportion of good quality colour photographs in print was low, so it was near impossible to find any detailed iamges to use for reference. Despite making efforts to find the right ribbon, it proved elusive so I had to make do with a standard polka dot pattern. So I was all the more interested to see what could be done now using the print-on-demand techniques Spoonflower offer. 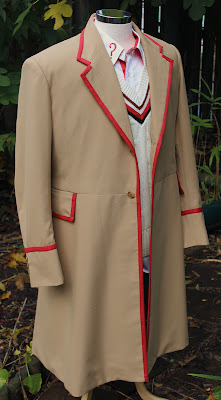 A friend of mine, Mark Ferris, who goes under the username of Linx The Sontaran on the forums, had been working on a design for a while and had researched the pattern. The best photo he found as reference is shown below. He could see the black ‘shadow’ and that is was more than just a shadow and had some form of shape to it, something like a tick. Working with that in mind he produced a patter for the Hatband (see left) though it was not quite the right shape. After posting his design in the forums, several people gave input and slowly the design improved. Below is the progression from a simple tick (below left) to a better shape (below centre) before arriving at a bird like shape (below right). Comparing it to an enlargement of the reference picture (see below) shows it is now a pretty good match. 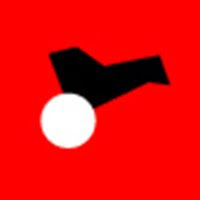 The artwork had only been done to a low resolution, so I took a copy of the design and worked it up as a vector-graphic in Adobe Illustrator to make it pin-sharp and as clean as possible (see left). Finding the right scale for the pattern was a little harder than I thought, as I needed to first establish the width of the ribbon, which goes around the hat twice (slightly overlapping), before working the design within the resulting space available. 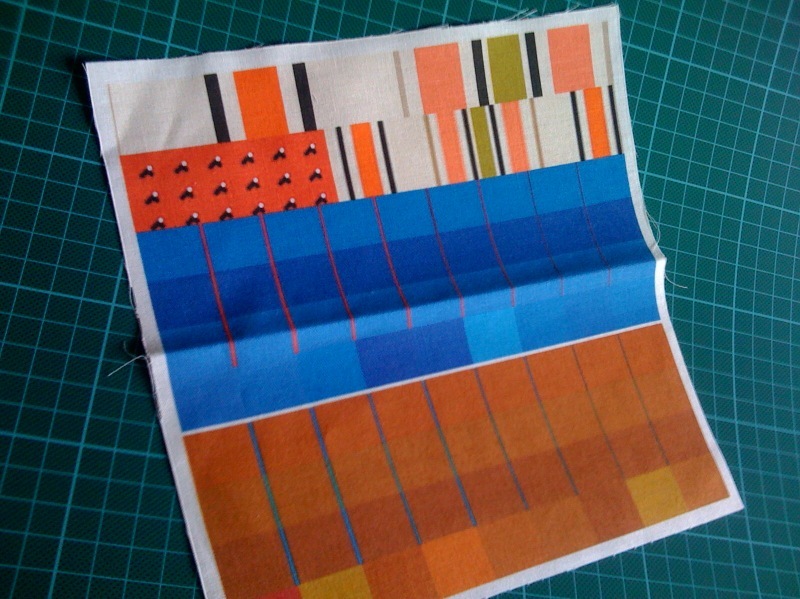 I first tested it in paper, which I cut out and wrapped around a spare hat to gauge the scale. Once I had got it close to the size I thought was right I took some pictures. It is surprising how different things look in a photo to how they look in-hand. It is then possible to do a much better side-by-side comparison. Results were good, so it was time to get a Spoonflower swatch to see how the colour was coming out, and how the fabric I had chosen to use would work. I added the swatch to a large order I had going through, and it came out pretty well, though I felt the red could be a bit more vivid. Some further test swatches have improved this, and now I think I am ready to order and make my first prototype hatband. . .
Ah I love these posts, showing the process to replicate.